"RSVP," "Please Respond," or "Regrets Only"
If you specifically want parents to stay for the party, state this on the invitation or discuss it when you accept the RSVP. Also Note: many school teachers do not allow birthday party invitations to be distributed at school unless all children in the class are invited. Mailing them out (or e-mailing, if you have their parents' addresses) is a safer bet. Who and How Many to Invite? 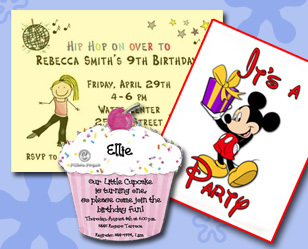 Parties for very young children will often include family members; cousins, siblings, etc. As your child gets older, invite only your child's closest playmates who already know each other well. These may be friends from daycare, school, faith community, sports teams or other activities, and neighbors. For children under 8 years old, the rule of thumb is to invite as many children as the child's age plus one. Some parents choose to add 1 or 2 to this equation, but only you can judge best, as you know your own limits and patience, and thus how many you can handle in your particular location, theme, supervisory capacity, etc. !